Learn how to make a wonderful origami bracelet with these easy to follow step by step instructions! This bracelet will be a truly unique gift! 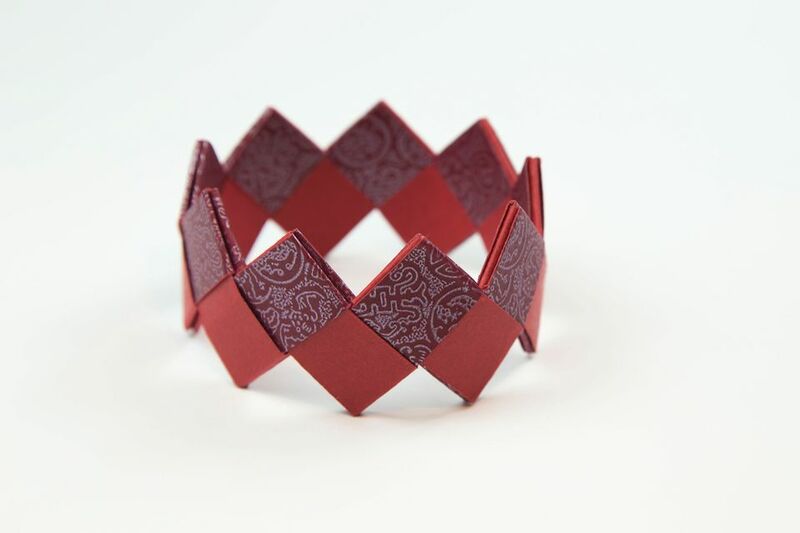 Using thick paper or thin card for this origami bracelet is recommended, there are many different types of paper that you could use! Some examples are: wrapping paper, music sheet paper, (cleaned) potato chip packets, magazines and so many more! The size you'll need for this origami bracelet is 15 x 1.8 cm. This size will get you a bold bangle. You can use smaller or larger sizes to achieve different looks. Some example paper sizes are: 10 x 1.2 cm and 20 x 2.4 cm. To find a particular size, check out this useful origami paper ratio calculator. 1. Start with your strip of paper white side up. 2. Fold the paper in half, from right to left and then unfold. 3. Fold the right edge to the central crease that you just made. 4. Fold the left edge to the central crease. 5. Fold the paper in half again, from right to left. 6. Now you have your origami bracelet unit! 7. You'll need an even number of units, about 18 - 20 of them. 8. In the tutorial, two alternating colours are being used. The yellow one is the first unit. Hold the first unit in your non-predominant hand. The two loops should be at the top. You can use a chopstick to open out the loops if needed. 9. Get another unit and insert it's two loops into the loops on the first unit. 10. Straighten them to look as shown. 11. Flip the two connected units over to the other side. 12. Open out the two loops of the second (pink) unit. 15. Once you have gotten to the last unit, take it and open it out. 16. Re-fold it so that it is an M shape. The coloured side should be on the outside of the M.
17. Bring the two ends together. 18. Insert the two ends into the last unit you worked on. 19. This is what you should have. 20. Grab the other end of the bracelet. Open out the loop, the opening should be in the middle, with the two inner layers being separated as well. 21. Put the two ends together through the open loop. 22. Pull them all the way through. 23. Fold the two ends away from each other. 24. Insert the outer end into the flap as shown, and do the same on the inside of the bracelet. Now that you have a pretty origami bracelet, why not make a simple masu box to keep it in, or give as a gift?